So it turns out that a tidy pantry can divide the internet, especially if it comes with its own set of mum rules! 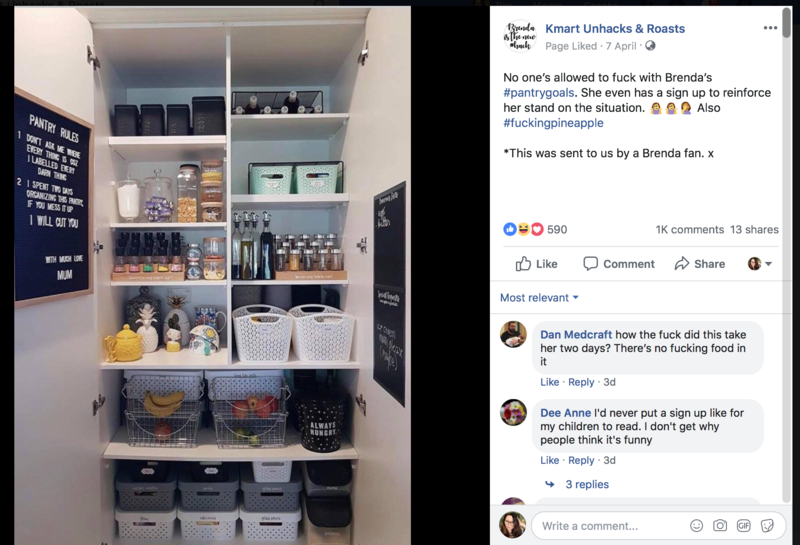 The Kmart Unhacks & Roasts group posted a photo on Facebook over the weekend and members did what they do best, they reeled off a bunch of witty, snarky and … downright admiring comments about the pantry in question! Now obviously this lady’s name is not really Brenda and she posted hoping to inspire others, not get roasted. But here we are and it’s happened. So let’s look at what people said. “I’d never put a sign up like for my children to read. I don’t get why people think it’s funny,” one upset type wrote. But others went weak at the knees, marvelling at how tidy ‘Brenda’s’ kitchen is and taking this photo in the spirit it was intended. “I wish Brenda would come and organise my pantry,” one commenter wrote.